Dividing the furthest reaches of the North Atlantic, Greenland remains largely unexplored. 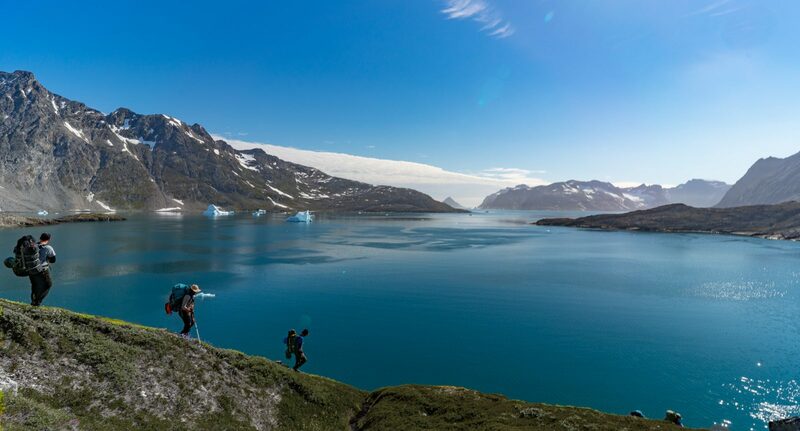 Its wild, ice-gripped shores are characterised by deep fjords, calving glaciers and sea bound icebergs, and remain home to hardy Inuit communities. Put glacier trekking and mountaineering skills into practice, and establish a new traverse of the Schweizerland Alps on this exploratory expedition to one of Earth’s last remaining true wildernesses. 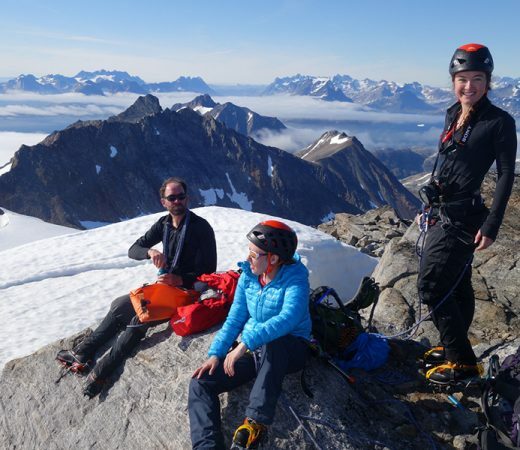 After developing basic mountaineering and glacier travel skills on the uninhabited Apusiaajik Island, the team will attempt to forge a new traverse across the untamed wilderness of the Schweizerland Alps. Journeying alongside meltwater lakes, across spectacular glaciers and amidst the awe-inspiring serrated mountainscapes, those newfound skills will be put into action. At the mercy of melting ice and the weather, the team will embark on a highly exploratory route, adapting route plans and expedition goals to map a new traverse that will seldom be repeated. 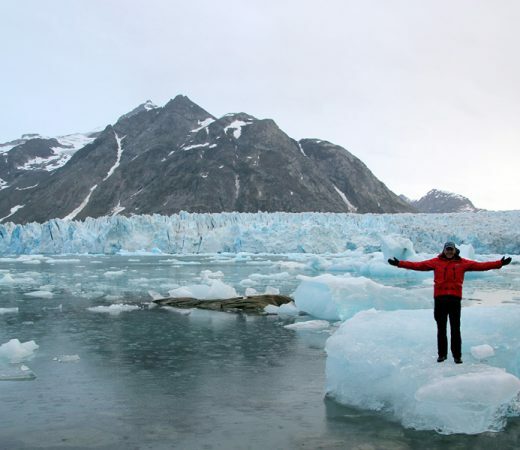 “Trekking and mountaineering through the jaw-dropping scenery in East Greenland was epic. 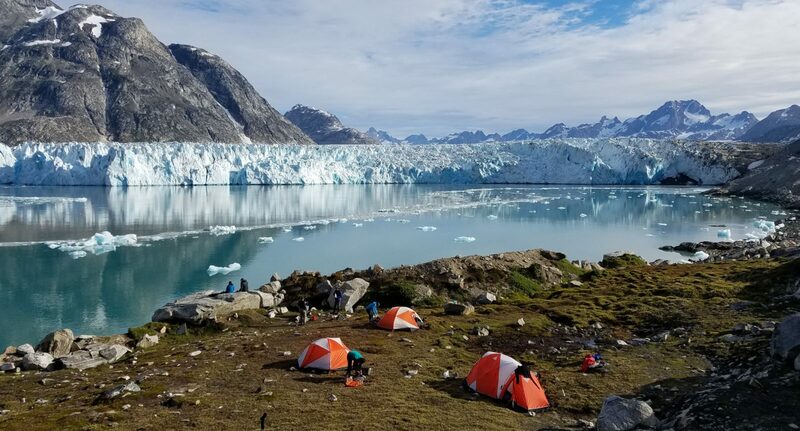 The people on the trip were very cool, and I enjoyed getting a glimpse into the Inuit lifestyle.” – Elisabeth Markham, 2018 expedition teammate. 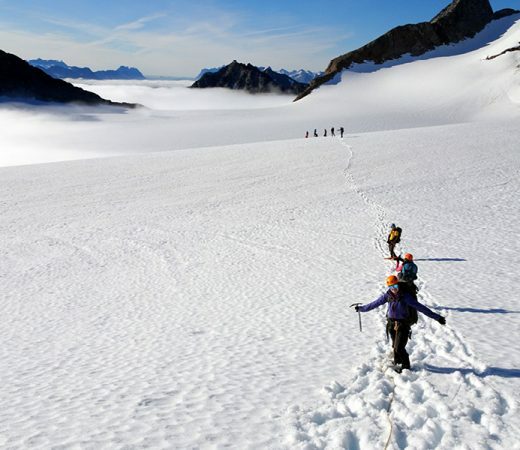 This uninhabited island is the perfect location to learn and practice basic mountaineering and glacier travel skills. Trekking into the interior of the island the team will pitch expedition basecamp. 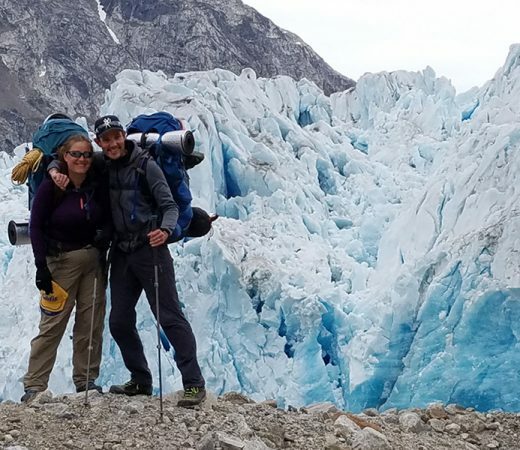 Over the next two days you will use crampons, harnesses and ropes to learn and refresh skills for glacier travel, and prepare the kit for the journey ahead. Just north of Kulusuk island lies the remote range of the Schweizerland Alps. Bound by glaciers, snow and ice, these alpine mountains are a majestic setting for a tough exploratory expedition. 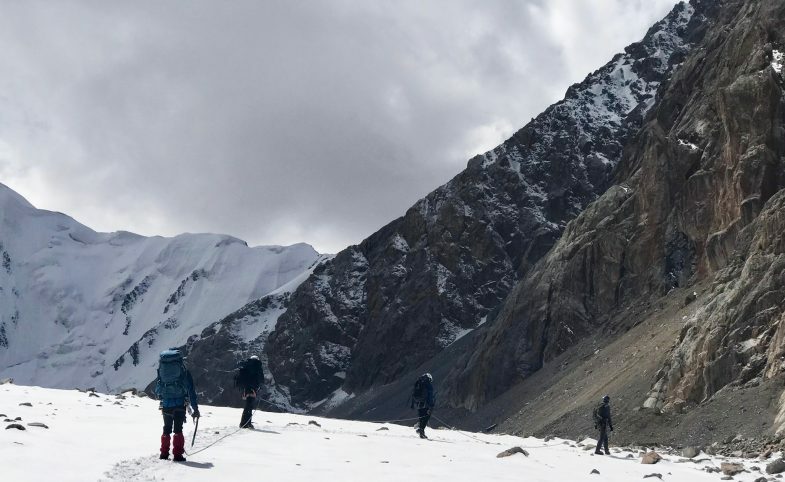 Navigating a new route from the coast, the team will use their trekking and mountaineering skills to cross rock, snow, ice, and crevasse fields, with a potential peak summit in the region possible, weather permitting. Much of this region remains largely unexplored. Its glacial conditions change rapidly, and the weather is highly unpredictable, meaning that the exact route and itinerary of this expedition will necessarily remain very flexible, until and even while the team is on the ground. 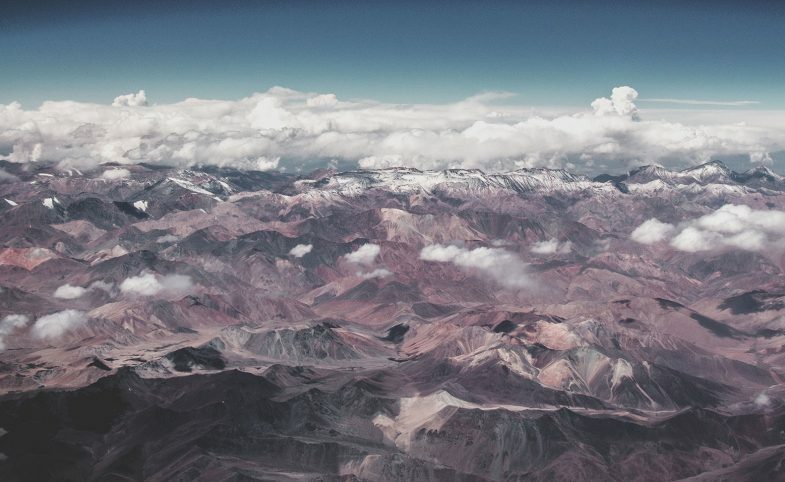 For anyone seeking a truly remote and exploratory experience this year, where anything can happen within the framework created by Secret Compass, this is it. At the mercy of Arctic weather and the Polar Current, Greenland is a testament to the pure drama of the natural world. Here, the scenery is supersize. The stark mountain backdrops are choked with vast glaciers descending to the shore, where giant icebergs drift silently in coastal waters. 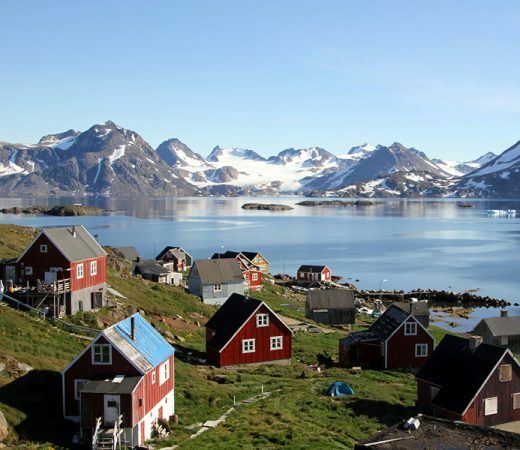 You’ll be quick to note why Greenland’s sparse civilisations are restricted to the coastlines. There are no roads connecting villages, and many Inuit communities must still subsistence hunt – seal meat, reindeer, whale blubber and dried fish are staples on the local menu, and the team will undoubtedly be presented with the opportunity to try the local Greenlandic diet as variation from expedition rations. Secret Compass runs expeditions with framework itineraries, rather than guided tours with set daily plans. Read more about Our Approach here. The following is the outline plan for this Greenland expedition – the ‘substance’ rather than the specifics. A fuller itinerary is provided in the Greenland Expedition Handbook which is available on request or upon Application to join the team. All teammates fly into Kulusuk on 5 August 2019. Most flights are routed via Reykjavik. You’ll be met by your Secret Compass expedition leader at Kulusuk airport before transferring to Kulusuk village for your first night and for the expedition briefing. After a boat transfer to Apusiaajik Island, you’ll establish a basecamp for the next few days and practice basic mountaineering skills, glacier travel and crevasse rescue. You’ll then take a boat north to one of the main glaciers in the region. This will be your access point for the start of the traverse. For the next week you’ll experience the very real and raw power of nature, tackling challenging terrain to navigate crevasse fields, travel over high passes, rugged fjords and down towards the ice strewn shores of the North Atlantic ocean. 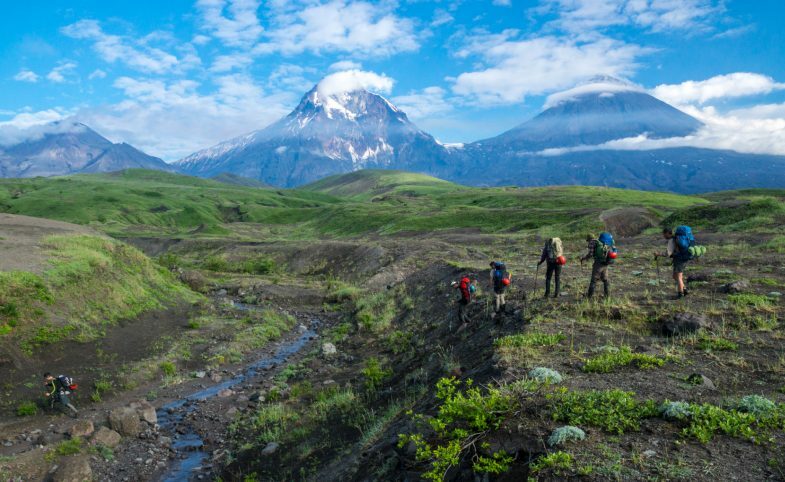 The weight of your pack will be the toughest part of this expedition, but the rewards of breathtaking scenery and a true spirit of adventurewill make this journey as fulfilling as it is challenging. After a week in the wilderness, you’ll return to Kulusuk by boat for hot showers and a celebratory meal. The expedition will officially end after breakfast on 17 August 2019, with teammates free to depart anytime on or after this date. 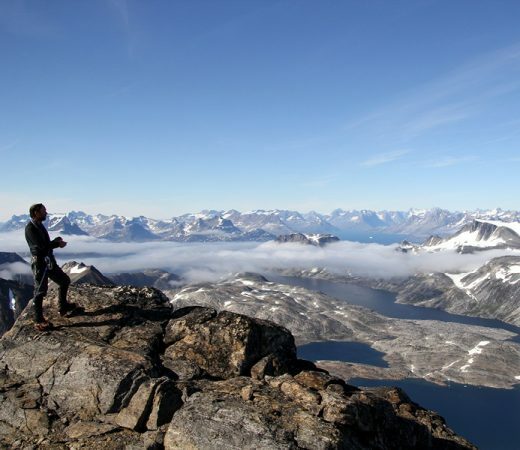 Secret Compass expeditions are achievable by anyone with a healthy lifestyle and a good level of general fitness. Team members should be willing to be part of a team working together to achieve the goal of the expedition. As a team member, you should have an adventurous and robust spirit. At a basic level, you should be comfortable jogging for at least 45 minutes and walking for eight hours in the hills, carrying 20kg for three consecutive days. The distances covered each day won’t necessarily be significant but the biggest challenge on this expedition will be the unsupported nature of the expedition – carrying heavy backpacks over difficult terrain. Teammates must be comfortable with the following. Terrain: over varied terrain including glaciers, boulders, rugged fjords and sandy beaches. Climate: exposed location with average temperatures of +5C but may feel warmer during the day and fall to near 0C at night. Applicants will receive a Handbook with further expedition information. View Secret Compass’s suggested Expedition Training Advice and get in touch with any fitness, health, training or kit questions that remain. Teammates who arrive without meeting the agreed minimum fitness requirements can jeopardise themselves and the expedition’s goal so do take training seriously, prepare as appropriate and arrive fit and ready to go! Team members would benefit from multi-day trekking experience carrying all of their equipment and camping out; experience of this in winter conditions is a bonus. Crampons and ropes will be used on the glacier, training will be provided although previous experience would be beneficial. Professional Secret Compass expedition leader. 24hour UK based Operations Room. International flights to and from Kulusuk. Alcoholic beverages and any costs of a personal nature. Secret Compass will provide the tents for this expedition. Teammates will each carry a share of kit and so will be sharing tents on this expedition to keep weight to a minimum. Most flights to Kulusuk depart from Iceland in the morning so you may need to arrive in Iceland the night before. If possible, choose a seat on the right hand side for the flight to Kulusuk to get the best views. Crampons attach to the bottom of walking boots to facilitate trekking on snow and ice. For this expedition you must bring crampon compatible boots (B1 boots recommended, something like the La Sportiva Trango S Evo would be ideal) and suitable, compatible crampons. Consult your local outdoor shop for advice if you need to buy these, otherwise they are available to hire. Secret Compass have arranged team members discounts with Cotswold Outdoor, Nordic Life, Outdoor Hire and Expedition Kit Hire, details of these will be sent through on booking. As The Plan tab outlines, there is a chain of transport to get teammates out to Apusiaajik Island so start and end dates are not flexible. This will be very challenging with no access to power once the trekking section begins. Please ensure that you are self-sufficient in terms of charging your appliances by bringing things like spare batteries, lightweight solar panels or power packs to avoid frustration. There will be limited signal around Kulusuk but not elsewhere on the expedition. Although sightings are rare, there are polar bears in Greenland and the team should be vigilant. The team will be carrying trip wires and flares as polar bear deterrents, and will take it in turns overnight to watch for bears. Your experienced Secret Compass leader will provide advice and training during the expedition briefing.